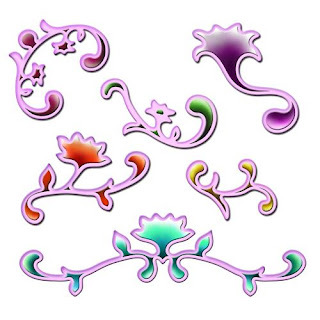 This set of 6 die templates features a bevy of flourishes with floral images. Buds and leaves sprout from graceful arcs. This detailed set of die templates won’t be wasted on any paper project. Two of the images are symmetric and the others are not, providing plenty of choices for embellishing with these shapes. Approximate Die Template Sizes:(Beginning with the upper-left "C" shape and continuing clockwise) 1½x1¼" 1⅝x⅞" 1⅝x⅝" 1½x1" 3⅞x1½"
Be sure and check out the card that Becca made using this wonderful set. Her work is awesome. These Spellbinder dies sell for $19.95 plus shipping. Please e-mail me if you would like to purchase this great dies. I accept Visa, Master Card and PayPal.